I'm a fairly satisfied Ubuntu 12.04 LTS user and I'm quite optimistic about the forthcoming changes to Ubuntu 12.10 Quantal Quetzal. But that doesn't mean they both are somehow "perfect" or something. Unity, which was a huge departure from the traditional GNOME 2.0 desktop, has been around just for an year or two. Though I generally like the idea, one gets easily frustrated because of bugs like these, Compiz crashes, slow loading launcher etc. To put it bluntly, when compared to rock-solid GNOME 2.0, Unity and the underlying GNOME 3.0 is not yet there in terms of performance or reliability. Ubuntu desperately needs the kind of attention-to-detail Android received with 4.1 Jelly Bean release. Android 4.1 Jelly Bean is considered by many as *the* smoothest Android experience ever to be released. Project Butter was the key to this impressive leap in performance. It was a major undertaking meant to squash Android's persistent issues with device lag. And it worked out pretty well for Google. Because of Project Butter, Android 4.1's interface runs at a much faster 60 FPS (frames per second). A more technical overview on the subject can be found in this YouTube presentation (Google I/O 2012 - For Butter or Worse). Why Ubuntu Needs a "Project Butter" like Android? When I say 'emulate Project Butter', I don't mean that Ubuntu should follow Project Butter in every technical detail per se. Instead, Ubuntu devs should aim at what Google achieved with Project Butter - silky smooth performance and very high levels of refinement. Ubuntu needs to improve on a lot of fronts. But my biggest gripe remain the performance of Unity. You might not notice issues if you're running Unity on a Core i7 monster (for example), but you will definitely see the difference when you run it on a lower spec'd device like netbook or even a "normal" laptop. After all, Unity is designed to work on small-screen, lower spec'd devices. The current state of affairs leave a lot to be desired. There is a world of difference in performance when you use Xubuntu instead of latest Ubuntu with Unity in netbooks. Saying Xubuntu (powered by light-weight XFCE desktop) is responsive when compared to Unity is an understatement. When compared to Ubuntu, XFCE is lightning fast. As of now, Xubuntu 12.04 LTS remains my most favorite OS for netbooks. You might have heard about Ubuntu's One Hundred Paper Cuts project. It is a project led by Canonical's Design and User Experience team to mitigate usability issues in Ubuntu by identifying 100 small points of pain for users, or "paper cuts", and healing them. The project has been a roaring success so far and now, Canonical need to take it to the next level. A good majority among you must be familiar with the context depicted in the screenshot above. Ubuntu Software Center (USC) taking forever to load. As a matter of fact, that is the first image that comes to my mind when I read about USC somewhere. 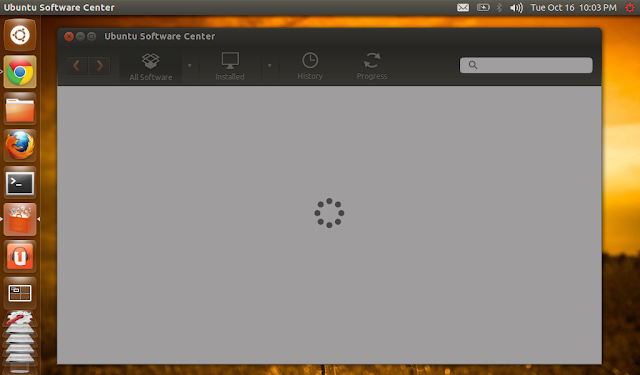 This is not a new issue, Ubuntu Software Center has been like this ever since it was first introduced. A lot of things can be done to improve USC, many of which we have discussed already. Think about it for a moment. Software Center is the most important application as far as Ubuntu and Canonical are concerned. It is their future revenue stream apart from may be Ubuntu One Music Store (excluding enterprise specific software and services like Landscape). If Ubuntu Software Center is indeed their core app, Canonical has to start treating it like one. Microsoft's Windows has remained the dominant OS for nearly two decades now. But things are changing, and fast. When Microsoft decided to release its own hardware for its Windows 8 OS (mimicking Apple's strategy for an even higher profit margin), Microsoft immediately pissed off many a hardware vendors. And now, with their closed eco-system approach, they are making enemies out of game retailing behemoths such as Valve. As a result, Valve has decided to put its resources on developing Steam for Linux, specifically Ubuntu. A number of popular game titles like Left4Dead2 are coming. But most importantly, a huge number of new users are also coming. Ubuntu has to give them the best experience possible. I am not a Unity hater by any means. I like the new work flow enhancements. And when I'm using Xubuntu, I miss a lot of features like Global menu (yeah that's right, I am among the 3 people who likes global menu). But I never would want to trade performance with features. Ubuntu 12.10 added a lot of new fancy features like the integration of Amazon and Ubuntu One music store results with Unity Dash. In my opinion, those things won't do any good if they don't work fast enough. Ubuntu needs to fasten up and lighten up things at the same time. This is not going to be easy, but worth the effort I believe.